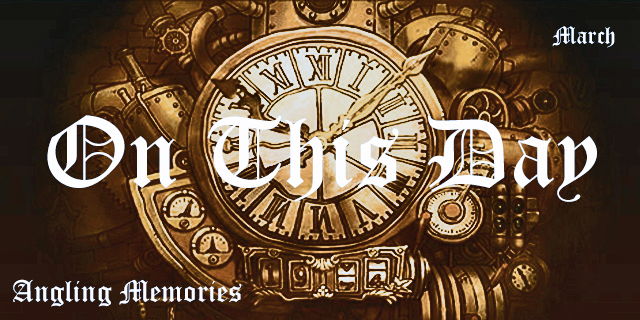 Pike Blog: Fight At The Wandte! Dan text me this morning to see if I fancied a bit of barbel fishing this evening, what could I say? He didn't know what time he'd be there, sometime around about 4.30, maybe earlier, and as I had the net and the bait I thought I'd arrive an hour earlier and try and catch a chub. 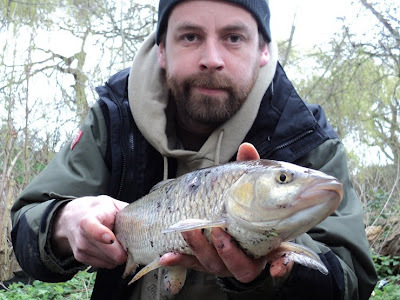 First cast a chub of 2lb 11oz, which as I took it's photo crapped all down my leg! Lucky? Then I found a parakeet feather. Lucky? 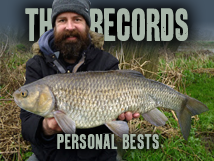 I met Dan and the first swim we tried I had another chub about 10oz before we moved on in search of a barbel. 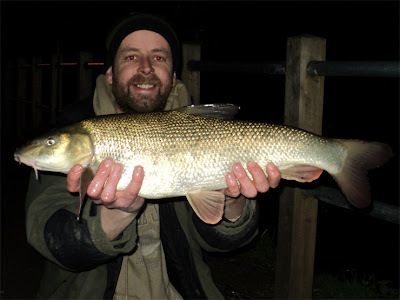 Next swim produced a 1lb 15oz barbel, again to me, and we thought we'd found our spot. We fished on for a couple of hours with only a few half hearted bites and decided to head to the pub... There was one last swim I fancied and it was on route to the pub. First cast I had a great bite and connected to a nice fish, it looked about three and a half or four pounds (a new Wandte personal best for me) until it spat the hook at the net. Next cast produced a barbel of exactly 2lb which fought well above it's weight. Next up Dan hooked into a good fish, unfortunately it broke him off just above the hook before we could see it. The night of lost Wandte monsters? Ten minutes later I had another bite, I struck and all went solid, then it moved, then all went solid again. Me and Dan wondered if this was a good fish or a snag, I kept pressure on it until after a few minutes it moved, nice fish on! I've had some nice barbel before in the river Wye, including a couple of nine pounders, but this was the best barbel fight I've ever had. We eventually netted it about 50 yards downstream - Dan went above and beyond the call of duty, netting it while hanging from a tree! 6lb 6oz, our new Wandte record. Fantastic. And then we went to the pub for a celebratory pint. And hello to Darren. Whom we met down the river and recognised me and Dan from the blog - hope to see you fishing next season. You wished us luck and we had it - thanks. Holy Mackerel, thats a fat barbel! Love the Chub photo. Well pleased! Going to have to beef up the barbel kit now, a light feeder rod and 5lb line isn't going to cut it if we're after a ten pounder - especially if they fight like this... And how Dan got it in the net I don't know, we've been joking all season that the net is far too small, and it'll take losing a good fish for us to chip-in for a new one! 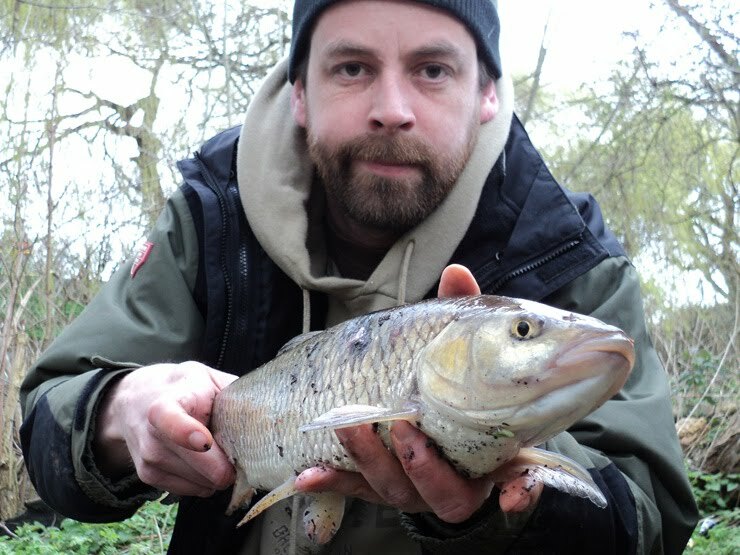 That is a baby, BARBEL have been caught to 14lb, plenty of 8-10lb fish too.